The 1999 film "Notting Hill" is set in the district of London by the same name where a bookshop owner played by Hugh Grant meets a famous American actress played by Julia Roberts, and if you're taking a trip to England's capital city, you can take a walking tour of locations made famous by this romantic comedy. To help you find the key locations, the following step-by-step instructions can be used a self-guided walking tour starting from Notting Hill Gate tube station. The walk is about two miles long and will take under an hour to complete from start to finish, but you could also spend more time at any of these destinations, so make sure to set aside extra time to enjoy some of these London staples. The Coronet opened as a theater in 1898 and was such a well-respected venue that it was where King Edward VII saw a performance and Sir John Gielgud watched his first Shakespeare play. It served as a cinema for the local community for years and was transformed back to a theater in 2010. If you have the time, you can return here later at night to catch an Off-West End show, a poetry reading, musical performance, or even an educational talk or discussion. The next stop on the tour is the home of William's little sister Bella, played by Gina McKee. From the Print Room, walk down Notting Hill Gate towards Holland Park tube station. At Holland Park station, turn right onto Lansdowne Road then walk until you come to 91 Lansdowne Road on your right. In the film, William surprises his younger sister and her partner Max (Tim McInnery) by bringing the famous Anna to Gina' birthday party. William and Anna wind up leaving the party rather intoxicated, laughing as they ventured out into the neighborhood. You can snap a quick picture in front of the building before continuing to follow the pair back into the neighborhood. Right around the corner, you can take in excellent views of Rosmead Gardens, where Anna and William first stumbled drunkenly after leaving Gina's house. Simply turn around and make your first right onto Rosmead Road. Anna and William break into these private communal garden, but while the movie may have made it appear like a good idea to break into these gardens, it's best to just observe them from the road. Not only is it illegal to trespass on this private property, but if you try to climb over the wall like Hugh Grant, there is a pretty big drop from the railings on the other side and you could get injured. Rosmead Gardens is part of the Ladbroke Estate, which includes other nearby private gardens: Arundel Gardens and St. John's. Despite looking like a small park, these private gardens are owned and maintained by the local residents who are the only people who have a key to gain access. From the gardens, head back to the left along Lansdowne Road, past Gina's house, and make a left onto Ladbroke Grove (the first left). Walk up a block to Elgin Crescent, make a right, then continue two blocks before making another right onto Portobello Road. This section of the street is known as Portobello Road Market, which is one of the most famous street markets in the world. 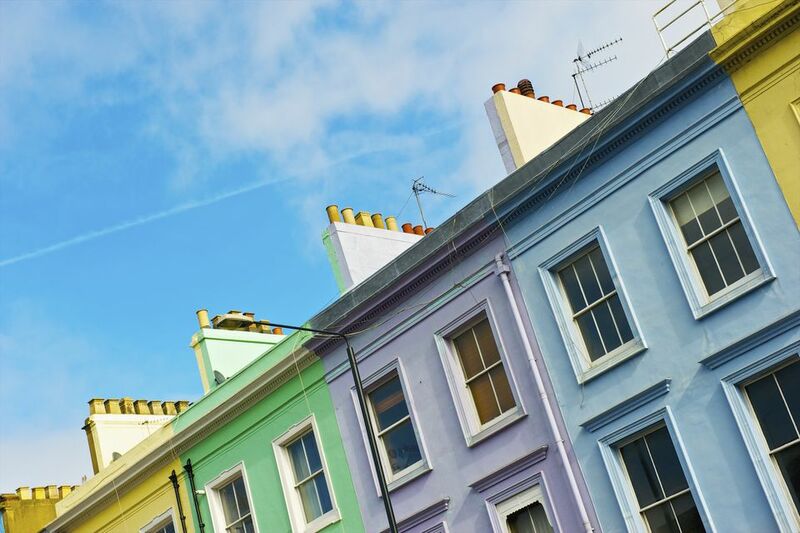 With markets held six days a week—including the popular Saturday antique sale—Portobello Road Market is a great way to spend the afternoon even if you're not a fan of the "Notting Hill" film. In the opening scene of the movie, William (Hugh Grant) is seen walking down Portobello Road Market on his way to his bookshop, The Travel Book Company. For fans of the film, in particular, the Travel Book Shop is a must-see destination on the walking tour and is less than a block from where you turn onto Portobello Road from Elgin Crescent. 142 Portobello Road was used as the location for William Thacker's (Hugh Grant's) Travel Book Co. in the movie, but there has never been a bookshop here. It was formerly the Nicholls Antique Arcade, then a furniture store called Gong, and it currently serves as a gift shop. There is a sign on the building on Portobello Road for "The Travel Book Shop" that's remained in place since filming took place in 1998. The fictional bookstore in the film was based on the real Travel Bookshop nearby (13 Blenheim Crescent), which you can get to by turning back down Portobello Road, walking past Elgin Crescent, and making a left on Blenheim Crescent. The original Travel Bookshop closed in 2011 but has since reopened as the Notting Hill Bookshop. For the next stop, you'll continue up Portobello Road to the left from the Notting Hill Bookshop, past Saint's Tattoo Parlour where a confused man in the movie stumbles out with a tattoo of "I Love Ken" but no recollection of why he got it. The next road, Westbourne Park Road, is where you'll find the famous blue door that leads to William's flat in the film. The house was once owned by the movie's screenplay writer, Richard Curtis. The blue door was incredibly popular and many people came to write their name on it, but the original was removed and sold at auction at Christie's. It was replaced with a black door to not attract so much attention, but time has moved on and the current owners have kindly painted the door blue again. The property is valued in the multi-millions and is actually a converted chapel, with huge windows and ornate church features so nothing like the studio set used for the interior scenes in the movie. You can't see any of this from the street though, but you can snap a quick photograph in front of the new blue door. Once you've snapped a photograph, head back across Portobello Road to the opposite corner, where you'll find a chain coffee shop called CoffeeBello. In the film, there was a small cafe next door with tables and chairs on the sidewalk, but now it's a hair salon. This is where William (Hugh Grant) buys a glass of orange juice and then bumps into Anna (Julia Roberts) on the corner, spilling the juice on her. He then explains he lives just across the road and suggests they go there to get cleaned up. From the coffee shop on the corner, you can continue down Portobello Road the way you were heading before stopping at the blue door. You'll pass under The Westway then turn right onto Golborne Road to arrive at 105 Golborne Road, where you'll find the location of Tony's Restaurant in the film. Now an art store and gift shop called Portfolio, this location in the film was owned by William Thacker's friend Tony (Richard McCabe). The aptly-named Tony's Restaurant was deemed a failure, but Tony and his friend Bernie played "Blue Moon" on the piano on the night it closed in the film. From here you could walk along Portobello Road all the way back to Notting Hill Gate, although Ladbroke Grove tube station or Westbourne Park tube stations are both closer. Alternatively, you could continue up Golborne Road and take a walk along the Grand Union Canal. To reach the canal, walk up Golborne Road and continue straight ahead, passing Trellick Tower on your right. When the road bends to the left and becomes Kensal Road, head onto the canal path next to Meanwhile Gardens. Turn right and in about 20 minutes you'll reach Little Venice where you could consider doing the Little Venice to Camden Walk. Do You Know the Secret Garden on Hampstead Heath?